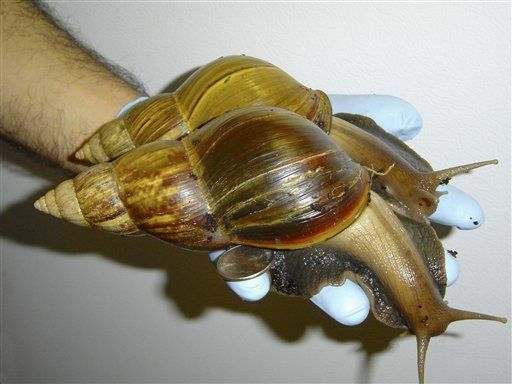 (NEWSER) – No, this is not a 1970s B-movie: South Florida really is dealing with an invasion of giant African land snails. The beastly mollusks can grow as large as rats (the biggest measure eight inches long, the Ocala Star-Banner reports), and can eat their way through plaster and stucco. More than 1,000 are already being caught per week in Miami-Dade County, and that number is set to swell when the mollusks end their underground hibernation, Reuters reports. Since September 2011, a disturbing 117,000 have been caught. The invasion isn’t just gross, it’s also problematic, a Florida Department of Agriculture rep explains, because the snails eat “over 500 known species of plants … pretty much anything that’s in their path and green.” And that’s not all: Their shells can blow out tires; their slime can make sidewalks slick; and they carry a lungworm that can give humans meningitis (though no US cases have been reported). They’re also tough to eradicate, since one typically produces about 1,200 eggs per year and can live up to nine years. The last invasion, in 1966, took $1 million—and about a decade—to deal with. Experts from all around the US held a symposium last week to discuss solutions. Among them: stronger bait.